Overview & specs of GPO Carrington Nostalgic Design Telephone - Black by Currys PC World. With 21st century function and novel vintage styling the GPO Carrington Classic Corded Phone, in black, will be an awesome addition to your household.If it ain't brokePlugging straight into the mains, the GPO Carrington removes the risk of your phone handset running out of charge mid-call. Simple push-button dialling is a most satisfying experience and with solid bakerlite-style construction, the GPO Carrington is hardy and will stand up to even the most punishing use.Packed with featuresAlthough the GPO Carrington would be at home in any early 20th century home, it has many features which bring it firmly into the modern age. There are no compatibility issues - the GPO Carrington works perfectly with all phone line providers, and even works with modern telephone banking systems.With a handy pull-out note tray, for scribbling down quick messages (or even doodling when you are on hold) the GPO Carrington Classic Corded Phone will add a touch of nostalgia to your modern home and is ideal for those of us who yearn for a brief respite from the computer chip. 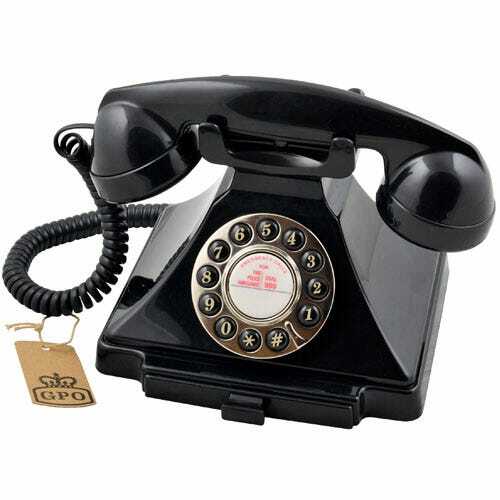 We are comparing prices for GPO Carrington Nostalgic Design Telephone - Black in new condition sold by Currys Pc World.